Hershey is fortunate to be home to the Penn State Milton S. Hershey Medical Center. Because of it Hershey has access to a world class medical facility and some of the finest medical care in the United States. How and why Penn State came to Derry Township to build a medical school and teaching hospital is a fascinating story, one best told by Samuel Hinkle, who was President of Hershey Chocolate Corporation and serving on the Board of the Hershey Trust Company and as Trustee of Penn State University at the time the decision was made. I asked Dr. Walker to stop by one day when he was coming through. When he did stop, we met at the airport here in Hershey, and brought him into the office. A few of us gathered around the table and said–I’d been on the board of trustees up there at that time–“Eric, what would you say if we tried to start a medical school for Penn State here in Hershey? His eyes popped and he said, “That would be different. I’ll take it up with my board.” So he went back and the board approved, of course. One of the most important conditions Hershey placed on their proposed gift was that the Medical Center must be located in Derry Township, as Mr. Hershey’s Deed of Trust stated. On August 23, 1963 Pennsylvania Orphans Court approved a $50 million gift from the Milton Hershey School Trust to The M.S. Hershey Foundation which would serve as the conduit of the money to build the Pennsylvania State University medical school and teaching hospital. The complex would be known as The Milton S. Hershey Medical Center. 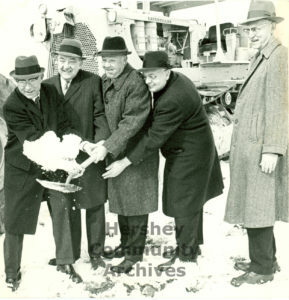 Breaking ground on February 26, 1966, the Medical Center was completed in 1970. And on October 14, 1970 Hershey Hospital closed to the public and patients were transferred to the new facility. A formal dedication for the Milton S. Hershey Medical Center of the Pennsylvania State was held June 5, 1971. Over the years the original medical center has greatly expanded as many millions of dollars have been invested in new facilities for research and patient care. In the 1990s, the medical center emerged as the township’s largest employer, with more than 6000 employees.